The Charlotte Stone Crabs added another mark in the win column by defeating the Dunedin Blue Jays 5-3 in game two of Sunday's doubleheader, sweeping the twin bill and earning a split of the series. 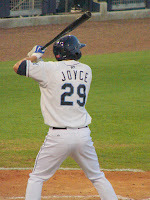 The Stone Crabs offense came alive in the second game, striking for 5 runs on 11 hits in the seven inning game. The Stone Crabs broke the game wide open in the second inning by posting four runs to the scoreboard. The offensive duo of Stephen Vogt and Henry Wrigley led off the inning with back to back singles. Michael Sheridan followed with an RBI single to score Vogt. Reid Fronk drew a walk to load the bases for the Stone Crabs. Anthony Scelfo, Isaias Velasquez and Tim Beckham each picked up an RBI in the inning to give the Stone Crabs a 4-0 lead. The Blue Jays cut the lead in half in the bottom of the second. John Tolisano drew a walk to lead off the inning then later scored on an error by Velasquez. Daniel Perales then scored on a ground out by Yan Gomes to pull within two. Dunedin added another run in the third inning. Gomes drove home his second run of the game with a single to center that scored Travis d'Arnaud and leave the Blue Jays one run back 4-3. The Stone Crabs picked up an insurance run in the seventh inning when Wrigley reached on an error, allowing Vogt to score and giving the Stone Crabs a 5-3 win. Nick Barnese improved to 4-3 with the win, striking out 7 and walking 4 in 5 innings. Marquis Fleming got the save with 2 shut-out innings, striking out 4 in the process. The Stone Crabs (26-23) are off for Memorial Day then continue the road trip with a four game series against the Daytona Cubs (24-26) at Jackie Robinson Ballpark on Tuesday. Joseph Cruz (2-4, 5.05) is scheduled to start for the Stone Crabs.